« Travel tips – long time no see, right? Everyone has heard about Old Faithful, so we decided we’d see that iconic natural feature first. We could just imagine how busy the area would be in the middle of summer, with a big parking area very crowded in late May! 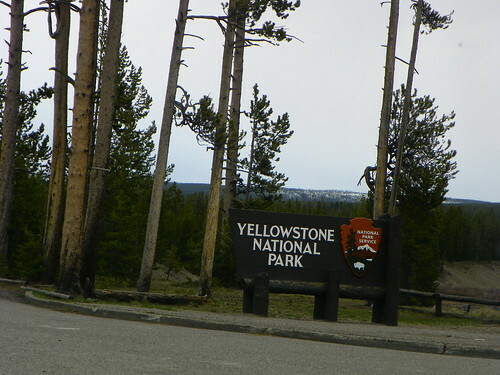 Heading in to the drive to Old Faithful, we saw several buffalo on the roadside, but couldn’t stop because of traffic. We regretted not being able to spend time viewing the bison, but more than made up for that later on…more on that in another blog. We followed the path to Old Faithful once we’d parked and found low benches in a giant semi-circle surrounding the area where Old Faithful spews once every- approximately – 70 minutes. A posted sign said that the next spouting would be at approximately 3:57 PM, plus or minus 10 minutes. The Parks Service is very clear that they are predicting, no scheduling. 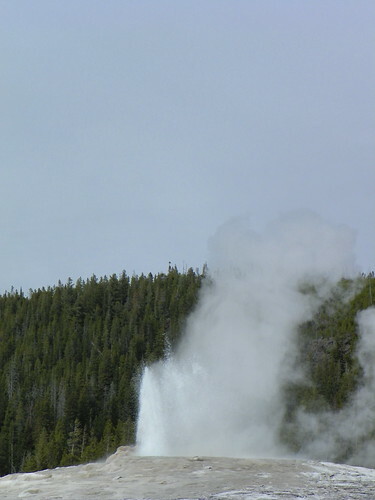 We finally saw Old Faithful do its performance. After a long 45 minutes of little gassy clouds, almost at the end of the predicted time, the geyser began foaming slightly and then raised a cloud of steam into the air, before calming down. 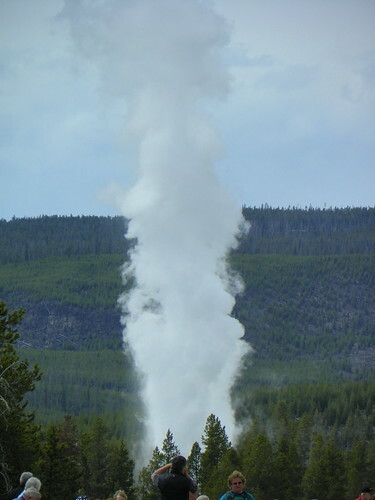 With Castle Geyser going off over 10 times as high in the distance, Old Faithful was a disappointment to everyone. You could tell because the end of the quick time of eruption and the almost instantaneous departure of the crowd made it apparent that no one was entranced. We were spoiled by Castle Geyser’s spectacular performance! Castle Geyser - less often, but more spectacular! More in next week’s blog on Yellowstone. Anyone who can get there will find it an amazing place. Plan to spend a couple of days or more to see the many sights. This entry was posted on Monday, June 14th, 2010 at 6:00 am	and is filed under Adventure, Family Fun, Historic, National Park, Romantic Locations, Scenery, Travel, Water feature. You can follow any responses to this entry through the RSS 2.0 feed. You can leave a response, or trackback from your own site.